It allows the government to cut service “within a localized area, such as a tunnel or bridge, and within an entire metropolitan area.” The policy comes with a murky, questionable history. In spite of the federal government’s aggressive attempts to keep this information secret, EPIC filed a request last month for the court to revisit its decision, arguing that “if left in place, [it] would create an untethered ‘national security’ exemption.” This time, the court gave the government until this Monday, April 27, to explain the details of its policy, including under what conditions it may be implemented. 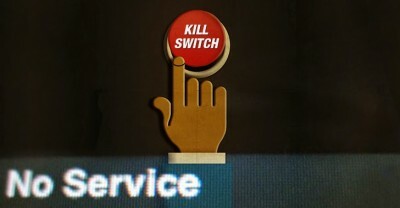 The push toward a “kill switch” has been building for years (and predates cell phones and the Internet). In July of 2012, Obama signed an Executive Order that “granted the authority to seize private facilities when necessary, effectively shutting down or limiting civilian communications.” In 2010, a Senate Subcommittee on “Homeland Security” approved a kill-switch for the Internet and in 2014, the House of Representatives introduced a cell phone kill switch bill in the name of preventing smartphone theft. In August of that same year, California Governor Jerry Brown signed a bill requiring all smart phones made after July 2015 to have a built in kill switch. The bill has been criticized for granting dangerous power to both law enforcement and hackers. The use of a kill switch has also been lambasted for what some view as an inability to prevent terrorist attacks. In fact, previous terror attacks have relied not on cellular communication, but merely on an alarm clock built into a phone—which would be unaffected by the use of a kill switch. The dangers of granting such broad authority to government seem not only abundant, but obvious. As seen in the 2011 BART instance, the state is more than willing to dismantle communication for reasons beyond national security. The power to disrupt the citizens’ right to organize protests against state action is an unconscionable effort to control the population and silence dissent. That the government is so resistant to explain this power is reason enough to distrust it. Although the court-mandated deadline has come and gone — as of midnight yesterday — without a response from the government, this story will be updated when and if they ever decide to offer an explanation for the shrouded policy.